This was supposed to be a dress. I started it when Adelaide was just a month old (frighteningly, I have the blog post to remind me how long it's really been), and I remember quite clearly thinking I'd make it a size big to give myself time to finish knitting it. So I made a size 6-9 months. Uh-huh. 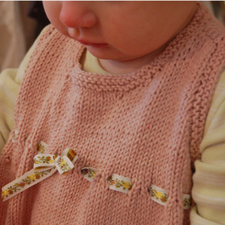 Fast forward a year - she's 18 months old, and there it sat in my knitting basket waiting to be finished. Yes, just waiting to have the edging put on. What is wrong with me, people? It took 30 minutes! 30 minutes! So now it fits as a top, which is just fine with me (I'm just glad it still fits at all). And it was calling out for some new pants, so these were made. 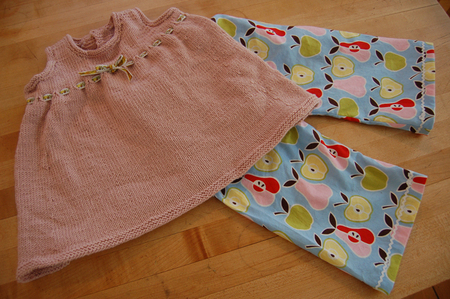 The dress pattern is from Debbie Bliss Baby Knits for Beginners. The yarn is Debbie Bliss cashmerino. 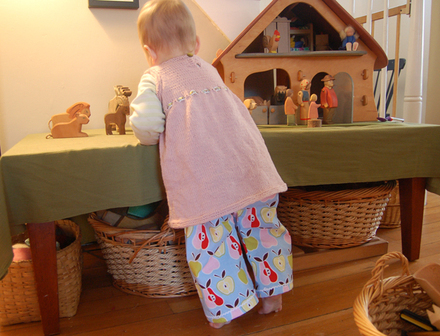 The pants fabric is by Robert Kaufman oops, Alexander Henry. And the baby is mine.